Learning How to Dance in the Rain ....: Seize the day !!!!! So I know it wasn't long since my last blog and yet here I am again - thats what happens when you lie awake staring out of your daughters bedroom window into the night sky. Too much time to think!! I was lying again thinking about how much has happened in these last couple of months - funny thing is if you had asked me at the beginning of this year if I would cope with something like cancer - I would have laughed and said are you nuts!!!! Before all this began we had already been going through a rough time related to many areas - work, staying here, indeed our long term future . I was weary with it all then and yet as I look out into the night and the amazing sky of stars dancing in the darkness I am struck that although yes I am tired - at present I am not weary. 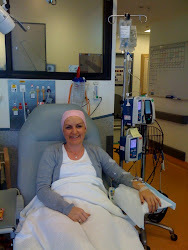 In these last months I have been diagnosed with breast cancer, faced a barrage of medical tests and procedures, may as well have taken up temporary accommodation at our local hospital, endured surgery and now my first chemotherapy. In this last week I have had nausea, tingling hands and feet, rash, itchy skin, sore bones, upset tummy and cramps, headaches, fatigue etc. Each day I am faced with a body that is not as I have known it - I have an arm that I have to be aware of for the rest of my life , I have an armpit that will permanently remain numb , not to mention the challenge of dressing! And yet in all this I feel more like me than ever !! I am not saying this road is easy - its not - but even today as I published a picture of my short hair on a social network page - I was reminded in an overwhelming way that I am not on this road alone. Such kindness and care around in my world. An encouraging word or deed - how powerful !! Life has had its twists and turns along the way - it certainly has not been an uneventful road so far. Yet here I am facing this giant and now I see a strength within me that I thought had long since past ! I know this is not of my own making and for that I am so thankful - those words I can do all things through Christ who strengthens me echo in my head. Over my life my journey with Him has ebbed and flowed, been challenged and had challenges and yet I realise now more than ever that He is ever constant. His love is truely unconditional and ever-present. This is not just true for me but for you too! So I guess my thoughts are don't wait for pain to stir you in these things - hold your life with both hands, tell those you love that you do , take time for those quiet moments of stargazing!!! Choose your battles , take time on the simple things and live life fully. I have shared before that a friend said that cancer is the gift that keeps on giving and yes the gifts are pretty lousy, but one gift that it has given, that is worth receiving, is having what matters in your life being brought into sharp focus. Don't wait for something like cancer to do that for you. Carpe diem - seize the day!!!! Well it is now very late or early hehe - so I shall return to my star gazing and hopefully fall off to sleep!!! "Somewhere out there beneath the pale moonlight , someones thinking of me and loving me tonight....."
Debbie so beautiful, I do feel for you knowing what your body is going through. But like you I found it to be a most special time. I remember sitting on my bedroom floor blubbering because I had wasted so much time searching for things and I didn't need to waste that time because what was so important was right here God, my family, my friends, surrounded by love. You have a wonderful way with words you should have your blog printed it would help so many people. Praying for you, Brian and the girls.